I’ve mostly heard a lot about ASOS online and was glad to hear that they have International Free Shipping $40+ (though I admit it does kind of look like International Free Shipping with no minimum on the website at first which would be an incredulously good bargain to be true) so I made a few orders. They each came from overseas within a few days! These are my thoughts on my recent purchases from ASOS. I absolutely adore this backpack from Adidas and I’m really happy with my choice in purchasing it! I needed a backpack, and it fits the athleisure trend really well. The straps are extremely light, padded almost to memory foam so they’re super comfortable. 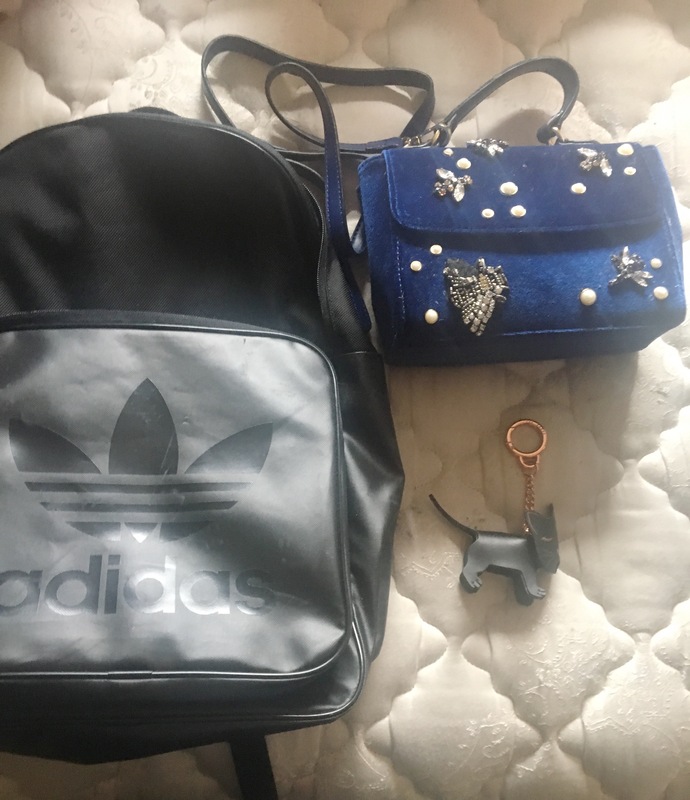 The front pocket is big enough to fit a decent amount of products and other things you may need, and also the main back pocket can fit several days worth of clothes and if I pack lightly for one night it can also fit my large Victoria’s Secret bag for my makeup, and my brush holder! My favorite part is that it has a pocket in the back for my Macbook! That way I can lug my laptop back and forth places without using a separate laptop holder or case. I’ve been using it as an overnight bag from my parent’s house and it has fit all my needs. The only thing is that it tends to fall over all even if it’s full so just watch out for that. I love this bag because it’s so cute and compact, and the clasp closes very satisfyingly shut. (You’d have to feel it.) Plus it’s also velvet, which hits a big notch for trends of this year! It fits exactly what I need, which is a larger wallet, my phone, a lip liner and lip stick, keys, wireless bluetooth headphones (these ones are from 8pm but I also like the ones from LG), and a compact mirror! (I’m including some more similar looking bags especially because it’s unfortunately sold out right now. Hopefully the bag comes back in stock by the time this post goes up! It has gone back in stock once before.) I will say that I was disappointed because some of the embroidery detail came off the bag within a few weeks and I’m worried about the rest of it coming out. I’ll still give it 4/5 stars because of cuteness and for the majority, it’s functionality! This keychain is so luxurious and the cat is so cute! While I wouldn’t say this accessory is extremely necessary for the price, I was looking for some new bobs for my keys and this is really nice! The key chain is a heavy rose gold with ‘Ted Baker’ engraved in it and feels very heavy and luxuriously expensive and the clasp for the chain feels very nice and works very well. If you’re looking for some extra bag candy, I would recommend Ted Baker in the future as it’s extremely cute and pretty well-made!